We started the year with an extra meeting: a Table Topic Marathon on the 8th of January! Four extraordinary Table Topic Masters entertained us and made think hard for each of the 6 speakers. Their topics where funny and creative and they challenged the imagination of our speakers. Thanks to Peter, Nicola, Stefano O and Andre! We also had the evaluations of Lesley, Roland, Sonja and Margherita, 4 experienced members who gave constructive feedback to the speakers of each Table Topic. 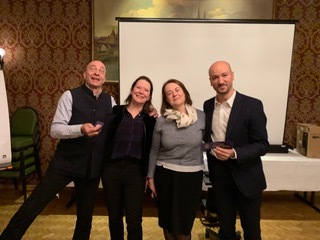 And finally 4 winners who started the New Year with the Toastmasters energy! Bravo to Roland, Hicham, Margherita and Lesley! Well done!